Looking for a uniquely Hawaiian way to enjoy an evening meal? Then you’ll love Maui dinner cruises! Enjoy great food and great atmosphere as you take a relaxing journey on the Pacific Ocean. 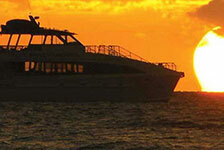 Book your Maui sunset dinner cruise by choosing from the selections below.